Sometimes I think of these poems as handprints on the cave wall, my way of saying, "Hey, it's me. I was here." Jean Nordhaus was born in Baltimore, Maryland, studied philosophy at Barnard College, and received her doctorate in modern German literature from Yale University. Her most recent book of poems, Innocence, won the Charles B. Wheeler prize from The Ohio State University Press and was published in November 2006. 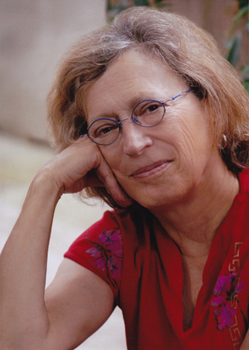 Milkweed Editions published her previous book, The Porcelain Apes of Moses Mendelssohn in November 2002. Other books include My Life in Hiding (Quarterly Review of Literature, 1991), A Bracelet of Lies (Washington Writers' Publishing House, 1987) and two chapbooks, A Purchase of Porcelain and A Language of Hands. Her poems have appeared in many journals, including American Poetry Review, The Hudson Review, The New Republic, Ploughshares, Poet Lore, Poetry, and Prairie Schooner, and were chosen for Best American Poetry 2000 and the 2007 Pushcart Prize Anthology. In addition, she has published numerous articles, essays, and dance reviews in the Washington Post, the Washington Review, Poet Lore, and the PSA Bulletin. From 1980 to 1983, and again in 1991-1992, she administered the poetry programs at the Folger Shakespeare Library in Washington, D.C. While at the Folger in 1982-83, she also administered the PEN/Faulkner Award for Fiction. From 1988 through the spring of 1994, she served as President of Washington Writers' Publishing House, a cooperative poetry press. A selection of her Moses Mendelssohn poems won the 1997 Edward Stanley Award from Prairie Schooner. She is currently Prose Editor for Poet Lore. Jean Nordhaus' poems are characterized by a quiet humility of attention, a dedication to the truthfulness of memory which allows the details of experience to rise . . . . Her poems seem to have ridden the wake of a great silence or calm before they're begun. Jean Nordhaus writes poems in an arrangement of stillness. She finds favor with serenity. Maybe this is because Nordhaus knows what to leave out of a poem. Only the seasoned writer trusts the reader, believes in invisible bridges, and knows the reader of poetry is as smart as the writer. Jean Nordhaus is a deeply intuitive poet. She moves to the center of the hearth without clutter or clumsiness. And it is hearth, the Latin root word for "focus," that is in her poems. Jean writes from matrimony, monogamy, daughterhood, and those cultural experiences so many of us share. What remains on the page, however, makes Jean her own poet, and so the poem remains uninfluenced by outside conditions. She may write about the world, but the work remains private and untouched by the forces pulling on her. Perhaps what we have here is an independent woman. Complexity is made simple in a speech aloof from the ordinary. Whatever the outer life is or was—we have dignity, detachment and the necessary strength to be autonomous. With The Porcelain Apes of Moses Mendelssohn, Jean Nordhaus has made a valuable contribution to the poetic sequence as spiritual biography. Nordhaus' . . . knowledge of German poetry (her doctoral dissertation at Yale was on Brecht)—of poets like Kleist and Trakl—has brought to her own writing something of their capability in the ordering of symbolic image . . . in the fineness of her ear, in her graceful and appropriate rhythms, and in the perfection of her lining there is every evidence of an acute awareness of . . . the musical dimension in poetry. There is a certain "poem feeling" I've come to recognize, not unlike the physical sensations by which Emily Dickinson knew poetry or those symptoms which A.E. Housman complained kept him from shaving. It can sometimes feel like a rush of malevolent glee—the madness of Max in the night kitchen—or the jolt you get at a school reunion when you recognize a face you hadn't seen in years, as if you'd been carrying it around unknowingly inside your brain all this time and only been waiting for the stimulus that would fire off that particular set of neurons. In many cases there is a congruence of something outside—a word or a smell or a taste—with something internal and long hidden. The sensation is not always the same, and not necessarily the same now as when I started to write, but always there is a physical excitement—a sense of being "charged." I think it is this sense of congruence, of recognition, that charges the poem, and I think that recognition occurs, in the best cases, at both ends of the process: in the writer at the outset of the poem and, if the poem is successful, in the reader as well. I don't know exactly what this process has to do with "making it new" in the grander sense, but I do know that if I follow the thread of this feeling—and follow it truly—through the verbal maze which it constructs as I go along, it will lead me to a place that is both new and strangely familiar. Many of the poems chosen below (most of them from earlier books) reflect a mood of profound astonishment, a mood I recall from earliest childhood and retain to this day, puzzlement at how strange, to borrow a word from Elizabeth Bishop, "how 'unlikely'" this life seems: the trajectory of the body through time, the volatility and unreliability of emotion, the fragility of human happiness. Many, I notice, are about art: theater, music, literature as tools of the spirit, ways of responding to the mystery of our life in time. I've just seen Cave of Forgotten Dreams, Werner Herzog's documentary film about the 32,000-year-old Chauvet cave paintings, a brilliant meditation on time and art. In the final frame, the camera lingers movingly on an image of the imprint of a human hand. Sometimes I think of these poems as handprints on the cave wall, my way of saying, "Hey, it's me. I was here." The butcher has gone mad and begun to write. in his pale blue eyes. See? He will say. back down in the sausage. Yes. you too hear voices: Back away! Away! you think. And then, Have mercy. ravaging the cabbages in rows. of amethyst and amber light. rising to a fierce crescendo. Bernie Goldbloom barks like a seal. A low growl blossoms into gibbon-shrieks. They are telling dirty jokes. covering my arms and legs. has black hair all over his body. I catch the pungent scent of bear. my name. I have breasts. I break bread with my hands. I pass the platter of chicken or lamb. to miners with sledgehammer hands. the curve of her body in waves. She is puffed like a pigeon. the pouter-folds of skin around her elbows. you must speak for them. a carnival between his hands. he draws an ocean sound. a membrane vibrating and expanding. will open like a fan. will make sounds like these. Curious, you fingered the keys. push up from the bellows. a tune in her mind. the nickel clutched tight in your palm. into a warm sea not knowing skin from water. my new curves nested in sand, heat baking my limbs. My young brothers buried me. I let them. They made a long corpse of me, a mummy case. toward the day when I'd awaken to my winged life. run lightly up and down the strings. and not yet taken on the new. with its fear of pain, its dread of annihilation. my lonely mother taught me dancing. It was afternoon, her cleaning done. Whatever she did, I repeated. to touch the sky, I lifted mine. with her arms, I did the same. continuing the figures hers began. that want to fly away. and struggle against thick ropes of sound. and sixes rush to twenty-fours. in one sharp, spasmodic throw. All the boats are bobbing in Nagasaki harbor. all breathing in the world had stopped. will bend in grief to meet her knife. All the boats are gone from Nagasaki harbor. with their sturdy "can-do," their capacity for harm. All she needs to know of irony, she knows. seeds of the maple come paired. that rooted in a self-renewing wall. so big he couldn't drag it to the water. and to raise a child . . . . It's night. The telephone lies still. settles her glasses on her nose and reads. and see clear to the bottom. in a state of longing.